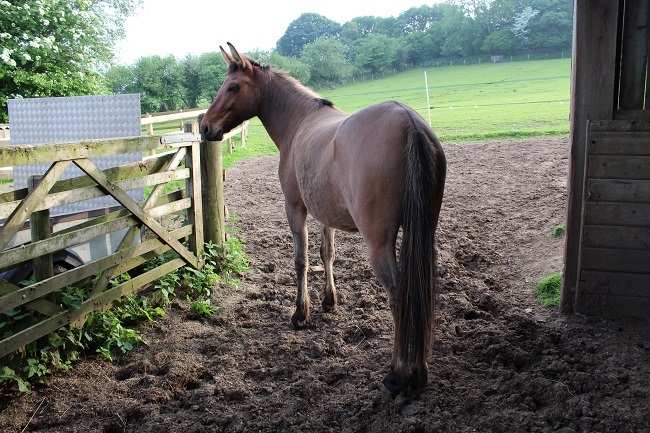 Last week, Marty loaded neatly onto a brand new, immaculate box from Kent Horsebox Hire & Transport and made his four hour journey down to Devon where he was to attend boarding school with Anna Bonnage. Considering he hadn’t been on a box since we bought him – and that had not been a pleasant experience for any of us – I was impressed by how quickly he loaded and how well he traveled. The central partition proved to be too much for him so Claire, the owner of KHHT, removed it which allowed him to travel loose. The groom’s area was sectioned off behind a floor to ceiling partition which meant that there was nothing for him to jump over or hurt himself on. It was like traveling in a stable. I traveled with them, and was able to watch Marty from the monitor in the cab. When we went past Stonehenge, I was surprised to see how much of an interest he was taking in the monument. He stood and stared at it through his window, ears pricked. Perhaps it was simply due to the slow traffic, and the great stones just gave him something to focus on; but I did wonder if he remembered them from his journey up here, and knew where he was going. Class started on the day of arrival, after a short recess during which Marty was able to have a biscuit and a glass of milk (…I mean, some hay and a bucket of water). 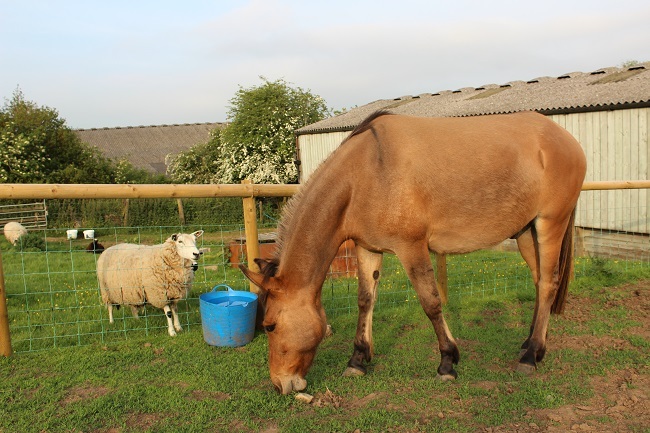 The halter is obviously not correctly fitted here – this was just a progress shot! The first session helped Anna get to know Marty. 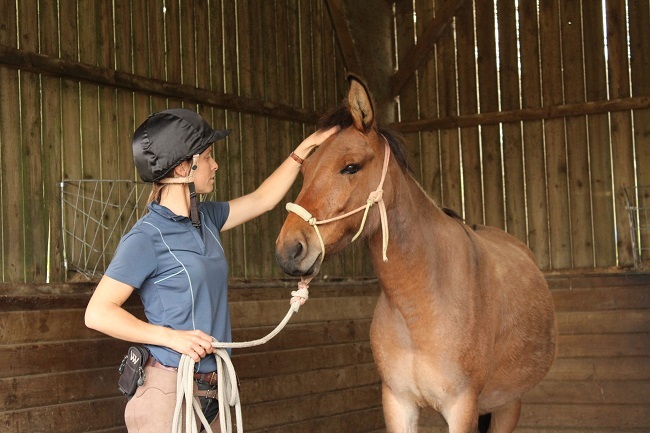 His traveling headcollar had been left on, and before Anna touched it or tried to swap it for his rope halter, she worked on drawing him to her while he was still in the stable. She explained about releasing when he turns his eye on her, and also told me that when he moves backwards I should go with him – calmly and without emotion, rather than trying to hold him and setting up the pressure. I had been trying to figure out what I ought to do in that situation, so it was good to have an answer. 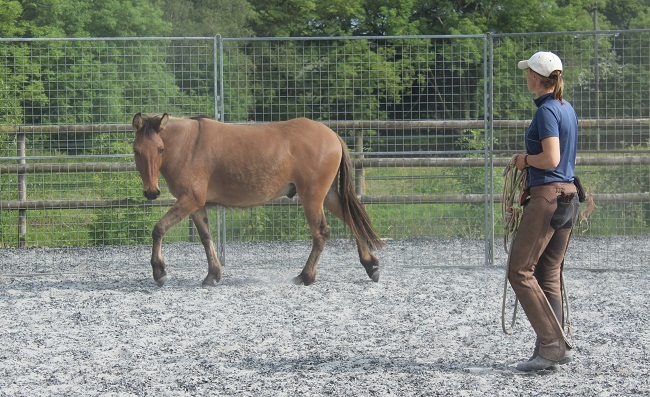 After that, the same work was repeated in the round pen. 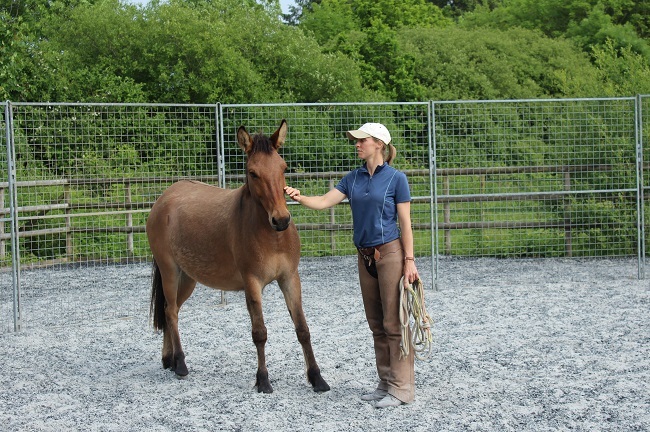 There’s no driving or chasing involved here – Anna always makes sure that the horse (or mule) is comfortable being in the centre with her before she directs them out. Marty wanted to stare at some horses in a field, so Anna spent a little while asking him to tip his nose left and right instead. He found this very difficult at first and would contort his neck into all sorts of positions, or even back-up, rather than let go of his thought. Asking Marty to let go of his thought and look in the direction asked. Once he could do that, Anna said it would be nice if he could walk around and come back in to her. She would ask him to step away – just by applying gentle pressure to the side of his nose – and his whole body would go rigid and resist before suddenly lurching to life and scurrying off. I’ve seen him do this with me, many times. Anna explained that it was because he did not feel good about bolting and being out there on the circle, but his explosions were because he felt like he had no way out. Getting after him straight away just made the situation worse, and the only outcome would be that he’d leave sooner. “Give him ten foot to change his mind,” Anna said. She added that he needs to know he can feel good out there, because if they know that going is alright, then they’re less likely to go. That’s part of the reason she asks them to look left and right when they’re fixating on something: it allows them to see that there is a way out, and that they are not trapped. These were things I’d picked up on at Harry’s clinic, but hadn’t really understood and had been too shy to ask at the time. My week of working with Anna one-on-one was great for me as I was able to ask all the questions that had been bubbling around in my brain! Anna is a great teacher and never makes you feel silly for not knowing something. Anna emphasised that here she is giving him something to go with, not get away from. …And here he is checking in. Another thing Marty does not feel good about is having people beside him. People in front of him is fine, but Anna said that he was very anxious about having someone stand alongside – a thing that became painfully obvious to me once she pointed it out – and that she wouldn’t even think of trying to introduce him to a saddle or rug until that was something he felt better about. I asked about what to do when he suddenly pulls away, runs out backwards or starts thrashing around, as I can’t keep my hand in place or even stick with him when he does that; Anna (very politely, I thought) pointed out that the answer there is not to push him to the point where he feels like he has to. I began to realise very quickly that I had been missing a lot of Marty’s more subtle body language. This was disappointing to me, as I’d prided myself on noticing small details. I just hadn’t been looking at the right ones. Marty’s new accommodation includes a barn. He likes his barn. He has sheep neighbours, which is good for him as they’re one of the things he likes to stop and goggle at. 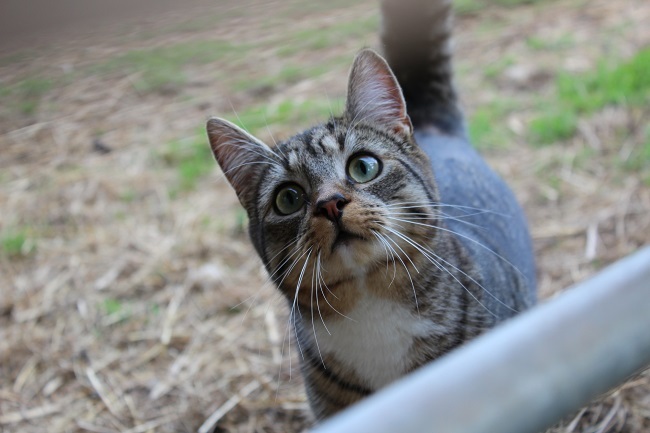 And there were farm cats, who had never seen anything quite like him before. In those scenarios, there had been an element of wishful thinking on my part. I’d really wanted to believe that progress was being made, and so I had maybe not been as observant – or had not acted on my observations – as much as I should have been. 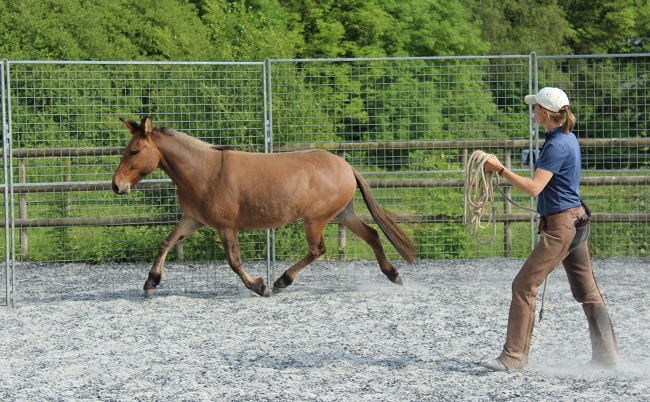 One of the things I hear over and over again about mule ownership is that the most important thing is earning your mule’s trust. 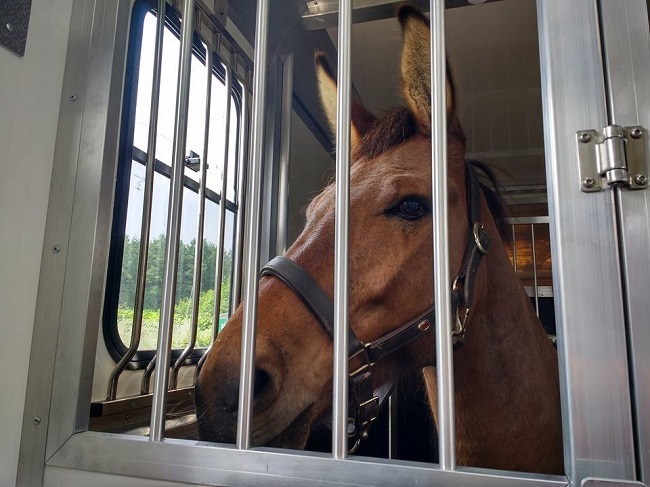 If your mule likes you, he’ll do anything for you. So many times I’d pondered that: I felt sure that Marty did like me, so why wasn’t he more willing to work with me? I realise now, of course, that he was. He was so willing to work with me that at times he would even over-ride his terror of the halter, or of being touched. What seemed like volatile, sporadic bursts was just him being unable to contain things any longer. Marty is a teacher. It’s not just myself who has been forced to reevaluate and adapt; Ben says he’s learnt a lot about subtly and controlled energy, and Anna said that she enjoys his brain as it makes hers work harder to keep up with him! An animal communicator once told me that, according to Marty, he and I were meant to “help people”. It would be nice if I could help him, first. Thanks for this post, gave me a lots of things to think with Muuli too. I have also done wrong at the stituations, when she just backs and tries to escape, I have tied her always to something that doesn’t brake. So there she is trying to escape but shen she figures out that she is tied, she stops and comes forward. Nowadays when she spooks when I’m walking her, she just takes some fast steps but won’t let the rope to get tight. I don’t trust her that much that I would go out and to walk her on the road without a bit on her mouth but maybe some day. Anna’s method is much better, just letting go if he needs to run away. Muuli is just like Marty when it comes to people standing next to her, not in front of her! 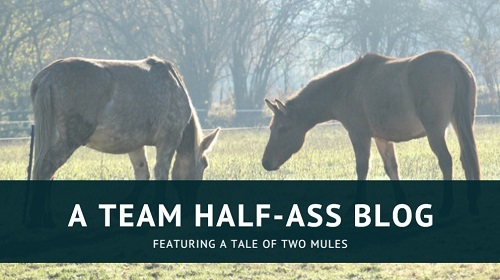 That must be someking of mule thing and needs a lot work to get over it. I’m very keen to see how Anna works with that problem! This is really interesting. I’m glad you found a good trainer to work with you and Marty. 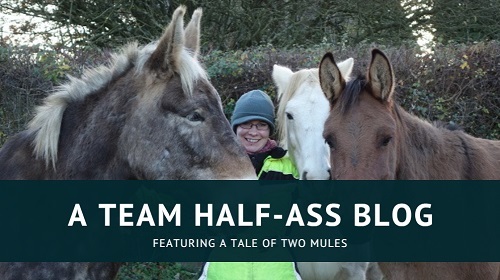 I will say, the idea that mules will magically do anything for you if they like you is just not true. Now, if they don’t like you they will not do things for you, but they don’t just do things because they like and trust you. Nilla likes me. But if she doesn’t want to do something, she’s not going to do it just because she likes me. She will do it because she’s trained. I put a lot more faith in good training. I’m glad you found a trainer to work with you both. I’m jealous that you got to spend a full week there too. Well done Sari, so pleased to hear all this positive stuff……and please stop being so hard on yourself about missed signs etc. You have done a brilliant job so far and it’s all to your credit that you realise the bits you need help with! 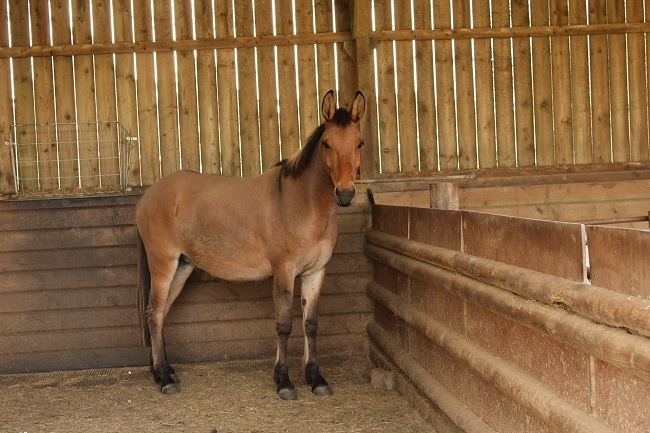 Marty is a very lucky mule!! doing with Betty a bit more!